If you yearn for more confidence when it comes to making money in Forex or wish you could learn some new things instantly, read on. This snippet of information has been written to help you understand some of the basic features of Forex trading, and gain the ability and flair to use the knowledge successfully in your own financial portfolio. To harness the full power of Forex trading, you need to understand the principles of buying and selling currencies. A trade is placed in the Forex Exchange, just like in the stock market, by exchanging one currency of your choice for another, with the intention that the price will increase or decrease depending on the type of the trade. An exchange rate of GBP/USD simply means the amount of GBP required to purchase one US dollar. Buying a currency is nothing but the amount of the quote currency required to buy one unit of the base currency and selling currency is the amount of the quote currency you get by selling one unit of the base currency. As you can notice here, the basis for any type of transaction is the base currency. A pair of currency is usually bought when you, as a trader, believe that the base currency will increase in its value overtime. Similarly, selling is done when the base currency is expected to depreciate in its value overtime. The range of trading available in Forex is so wide and varying that you can use them to build your portfolio at a safe pace. To make your initial choice easier, you need to decide whether you want to buy or sell the currency in question. Buying a currency is equivalent to buying the base currency (while selling the quote currency), with the hope that the value will rise eventually and you would be able to sell it at a higher price. In traders language, this is called „taking a long position“. On a similar note, selling a base currency is expecting the price to fall or „taking a short position“. The world of trading and investing has taken some rough bumps out there through the economics we have been in lately. While some are crying gloom and doom others are coming up with new inventive solutions for making money through investment trading. eTora is one such concept and has become the leader in social investment trading. They guide you by the hand by letting you watch and copy the best traders that are making the most money to see how they do it in real time. They offer you the ability to set up a eToro Demo Account. This lets you follow the best performing traders and copy what they are doing. It tracks your progress and investment just like it was a real investment and gives you real time data to do it in. Check out our website at socialtradingblog.net and find out what the entire buzz is about. They specialize in social trading in commodities, currencies and indices and take you by the hand and teach you how to become the true master of your own money. The traders at Wall Street are not happy that so many investors are learning how to make successful investments without paying them. Visit eToro and find out how to set up you Demo account today it is fun and easy. In other profession copying what the best is doing sets the current trend, so why not investment. Some traders are just continually making better trades than others and socialtradingblog.net lets you see the how and the why of their path. Using an eTorro demo account can let you be guided through the right tools and how-to’s of making the right investment choices. This option has a feature called the Guardian Angle that advices you and tutors you as you learn copy what the best traders are doing to make money. When you have the confidence to go tot real trading Guardian Angel will still be there to guide you investment decisions as well. Grab so more info from eToro and find out what excitement is going on in the investment social community. Today’s investment market is up and down and finding new innovations is smart business. There is a new concept out there called social investment trading and it is becoming the buzz idea of the industry. eToro is the largest social network investment firm today and they have some revolutionary ideas that are changing the way investments work. You can look them up at socialtradingblog.net and see what the buzz is about. In any endeavor one can look to those that are being successful and copy their patterns and efforts. In the world of sports these method sets the current trends. At eToro they let you have the ability to let you download a program called a demo eToro account, this lets you follow the best most successful trades taking place in real time and being able to copy what hey are doing. This program gives you unlimited ability to trade with a demo account in real trading time to develop you skills at copying what the leaders and trend setters are doing to make money. This program puts the ball back into your corner and lets you learn to take care of your commodities, currencies and indices investment needs. This software that lets you train in real time investing can be found at http://www.socialtradingblog.net/. Check them out and find out more about what social investing is all about. Within this software concept is a program called Guardian Angel that nurses you along as you learn to analysis and make decision for trading. This helps you analysis what the most successful traders are doing to make money and guides you to coping the process their using the right way. Being able to take control of you funds is the right idea because nobody cares for your hard earned money like you do. Depending on a broker is distant that lack innovation and that caused a lot of the financial problems we are in today is a dying concept. Get your software today and join the fun in real time by visiting eToro to get your software today. eToro brings the excitement and fun of trading back into the investment venue and they are here to stay. There are several tips that a person can use in order to trade successful with eToro. The first tip is to learn everything that you can able to Forex market. This means learning all about the different techniques that are used in the trading market. The best way to do this is for the beginner to read all of the different forums and blogs that have anything to do with Forex trading. The second tip is to figure out which one of the forex trading strategies are going to work the best for you and your trading skills. These strategies are going to be able to help a person to overcome any of the things that could happen when a person is trading. Therefore, a person is going to be able to keep their emotions out of this particular situation. The third tip is to come up with a trading plan that is very strong. This is going to take a little bit of time to do but it is going to be well worth it in the long run. Therefore, a person is going to set up a budget and a goal when it comes to the amount of money that they are going to be willing to spend when they are trading with eToro. The fourth tip is to make sure that you use a platform that you are going to be able to depend on when you are trading. This is going to help a person to understand all of the different aspects of the trading market. There are a lot of different platforms that a person is going to be able to use that is going to be very easy for them. The fifth tip is to learn everything that you can about the risk that are involved in trading. Therefore, the person needs to learn how to manage all of their risks and losses that they are probably going to have when they are trading in the market. This is going to help a person to figure out whether or not they need to take a certain risk or not. Most people have heard of the foreign exchange market, also referred to as the forex market, but do not know exactly how it works, or how people are making money from it. It is a place where the world’s currencies are openly traded. An amazing fact about the forex market is that nearly a trillion every day in volume is being traded. The rate of volume traded daily is expected to grow as more and more investors become interested and knowledgeable about the foreign stock exchange market. Unlike the stock market, currencies are traded over the counter not in a central marketplace. The decentralized market allows greater opportunities for traders to be able to choose from a selection of different dealers, dealers who can make trades and offer a variety of prices. All trades involve the purchase of a single currency while selling of another simultaneously. In the foreign exchange market the value of one country’s currency is set by comparing it to another country’s currency. How the rates of exchange are determined between currencies is easily explained. The currency under consideration, the first currency, is called the ‘base currency’ of a currency pair. The second currency of a currency pair is called the counter currency. When the base currency is being bought it will be displayed how much of the counter currency will be needed to buy each single unit, of the base currency. When buying and selling a currency pair you need to understand that the while a country’s base currency is being purchased, the country’s counter currency’s is being sold. Some of the most traded currency pairs most often traded on the forex market includes the USD/JPY, GBP/USD, EUR/USD and the USD/CHF. New and interested traders can learn more about forex trading by taking advantage of many of the free trading demo accounts found online. Many currency trading firms offer these kind of free demo accounts as a great way to get new interested investors to sample how the market works. It is very easy to register for a free demo account and it is a very valuable tool to learn the ins-and-outs of the foreign exchange market. eToro isn’t just another trading site. It’s a social site that helps you make money in a variety of ways you have never thought of before. From mimicking what the experts do to helping others with your expertise, the social element of the site keeps you focused on your trading while learning the craft. If you were to spend enough time reading books gathering information online to become an expert trader, you’d never have time to do any trading yourself. With eToro you can learn to be an expert trader, investing and making money the entire time. It’s easy to interact and ask questions of expert traders who are patient and willing to help a new investor. And because eToro is a social site, you will have a lot of fun interacting with people. The training is so informal and fun that you’ll forget you’re actually learning valuable lessons that will help your investments years down the road. There’s more to it, though. With their CopyTraders and MobileTrader tool you can shadow expert traders while they do their work and make the same great investments that use to make lots of money. Us the tool as a sort of training wheel as you learn the patterns and strategies that make a good trade. In a short time you will have mastered all of this. You will have become an expert trader without putting much time or effort into it. When this happens, you will be able to counsel newbies by becoming a Guru. Sharing the joy and fun of investing has never been easier. These days, almost everything is being done online. A lot of people Har so much information going to and from their personal computers, it was only a matter f time for consumers to feel comfortable working on their personal finances online. eToro is an investment bank that provides online personal financial services through online electronic trading platforms. Not to be confused with an actual bank, eToro offers a software that assists personal investors and allows them to connect easily with third party brokerage service companies. From there, you will be able to pick and choose which companies you want to work with. Like a virtual bazaar, you can decide who has the best price and services for you and your investments. Even though the transactions are all done online, eToro works hard to make sure you are confidant with all your personal finance transactions. Using eToro is simple. If you plan on investing your money in brokerages online, you are going to want to know the most accurate information possible. Since eToro is an online software company, you will have direct access to the market and its inevitable fluctuations. eToro gives users access to charts and graphs that inform them of the hanged made hour to hour or day to day. It is extremely important to act quickly as prices change often and without warning. Making sure you are ahead of the game with the right information, will give you an edge not found elsewhere. Next time you are looking to invest your money in a reputable online brokerage, look into eToro for professional help and quality assurance. Currency trading has drawn the attention of many people that previously would not have invested much thought in the forex market. There are a few reasons why people are drawn to currency trading. The first reason is that they have heard tales of many people having amassed huge profits from the currency market. The other reason is online services such as eToro have made it quite easy to trade in the currency market. However, many people will have concerns whether or not eToro is an outright scam. A closer look at the complany will reveal the answer. 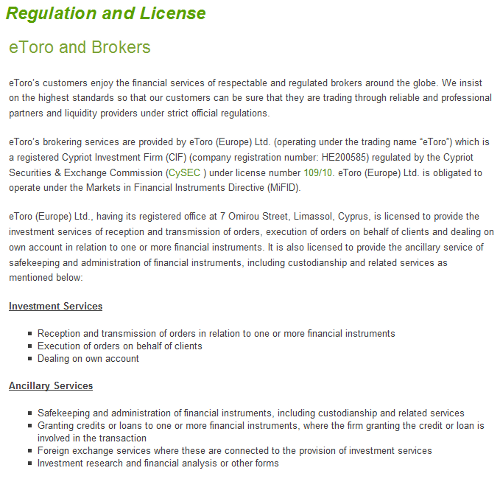 Based out of the country of Cyprus, eToro is not an actual broker. Rather, it is considered a software platform that helps those that sign up with the trading platform can be connected with third party brokers to actually execute the trade. eToro also has an educational aspect to it in the sense it promotes the notion members can develop a more intuitive approach to trading. The eToro platform offers visuals of financial transactions and these visuals help set the stage for becoming more intuitive towards forex trades. Indications of the company’s credibility can be drawn from the fact it is is regulated by CySEC exchange authority. This means it must operate under the rules, regulations, and oversight of said commission. The company is also used as the trading platform of two major forex brokers. These brokers are IFX Markets Inc and RetailFX Limited. The former is the US wing of a London based company an the latter is a trading company based in Cyprus. Those with further questions and concerns regarding whether or not the service is legitimate are advised to examine credible reviews written by actual members of the platform service. Have you ever heard about eToro and you was wondering what the hell this should be? eToro is the worlds leading forex broker and offers innovative trading tools. The newest tool of eToro is the social trading platform, which allows the users to see what other traders are doing. They can view the current trades of other users and with the CopyTrader tool, they can copy each trade! So as an eToro user you can search for profitable top traders, view their current trades and copy the trades. With eToro forex trading became very easy. So if you wanna give eToro a try or you want to check out more information about this broker, read this blog. I will give some more details about eToro and the tools which are provided be this broker.